CJ FULTON shot straight to the top of the class in last year's U-16 Schools Cup final, scoring a remarkable 47 points for St Malachy's. His staring role, including 15 three-pointers, for the Belfast school in their 62-46 win over St Mary's Tralee drew a surprising level of attention. "I didn't expect a reaction. I knew I played well but I didn't think it would raise as many eyebrows as it did," he recalled. "Kieran Donaghy said a few words about it and that grabbed more people's attention and then it was on the news and everything. It was crazy." 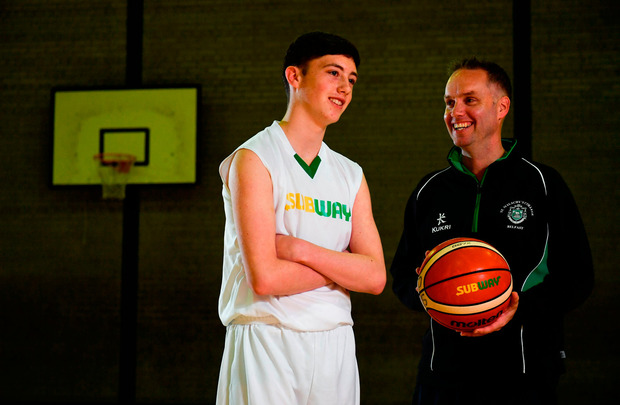 Today Fulton focuses on Gael Cholaiste Mhuire for a place in the semi-finals of the U-19 Subway All -Ireland Schools Cup. Although he remains realistic about recreating his heroics of last year's final in the current campaign. "I don't know if I'll shoot like that ever again. I'll try but I'm not sure I'll get up to that," he said. The Belfast boy boasts a strong family basketball tradition as son of the legendary former Irish international Adrian Fulton. Dad Adrian, who was one of the last Belfast Star players to claim the Super League title, has the club riding high at the top of the table since taking over as head coach this season. Despite being just 16, CJ has played his part too for Star in the adult league, contributing to last week's shock win over Tralee Warriors. "We didn't think he'd be playing nearly as much as he is," Adrian reflected on CJ's club contribution. "It's more out of necessity, Aidan Quinn is injured, Conor is basically playing with one hand, and CJ was given the opportunity and he's grasped it." CJ hopes his dad's midas touch can take effect for St Malachy's as he is also the school's U-19 head coach, creating a unique father-and-son relationship. "He knows his stuff obviously. He's a bit more lenient. He knows when I'm tired and stuff. It's just easier. He just knows," CJ says of dad. "I've been playing basketball as long as I can remember. From a baby, I always had a ball in my hands of any sort but basketball was certainly the first love," he said.